As we didn't get to take a vacation last year because of my various ailments, we decided to make it an extra good one this year and also have a belated anniversary celebration while we were at it. 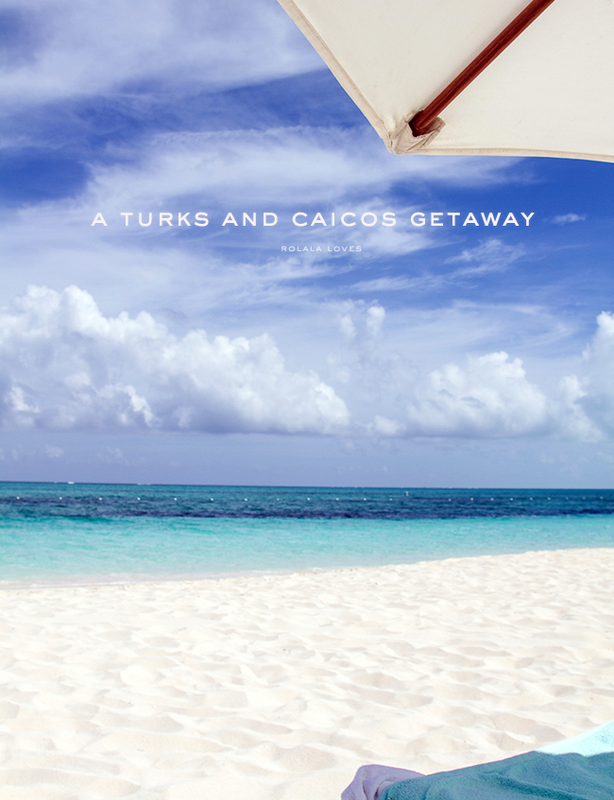 We decided on Turks and Caicos which is a chain of islands in the Caribbean known for their glorious silky white sand beach with the most brilliant turquoise blue water. Besides being on our travel bucket list, it's also just a 3.5 hour flight from NYC. Adding to the convenience factors, the official currency is the US dollar and the official language is English. 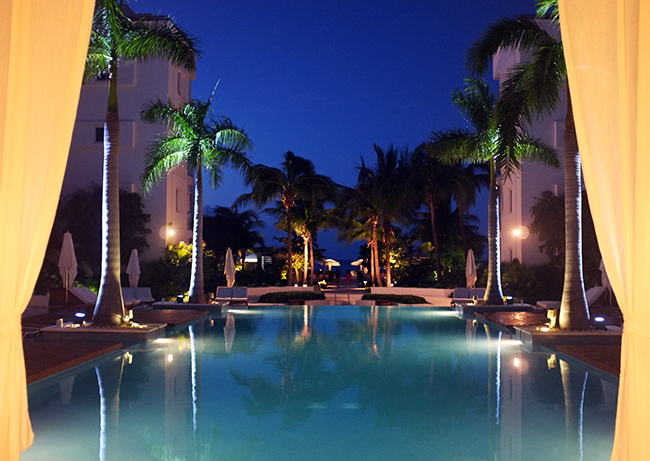 There are plenty of choices for accommodations and we chose to stay at the Gansevoort Turks and Caicos for both it's modern design and intimate vibe. The service provided by the hotel was stellar as our airport transfer was promptly waiting with cold bottles of water when we exited the airport and we were warmly welcomed with cool towels and cold tropical drinks as soon as we arrived at the hotel. After a brief tour of the property, we were shown to our room where a complimentary bottle of wine and fresh fruit plate greeted us. 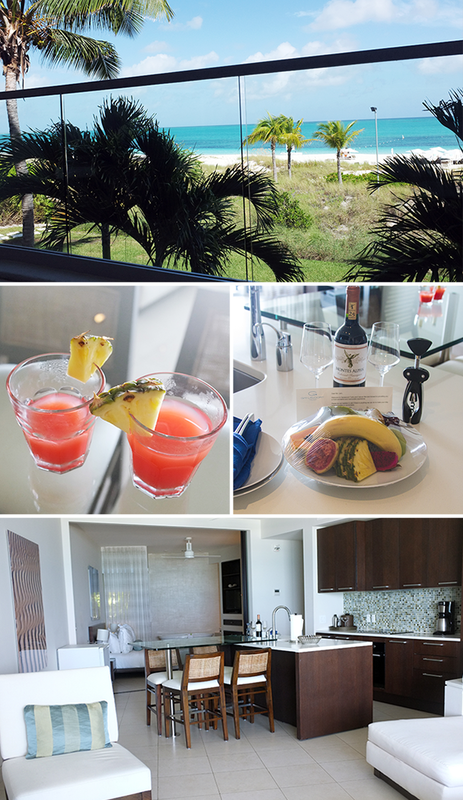 We took this all out onto our private balcony to enjoy along with the incredible ocean view almost immediately. We splurged on a one bedroom luxury ocean front suite and and it was worth it as it had all the amenities of apartment living including a washer/dryer which we did use. The fully equipped kitchen was quite impressive even though we didn't really take advantage of it. My favorite feature was the full sized soaking tub located a few feet away from our bed. It filled from the ceiling which could be an adventure but it was a real treat and I'm so glad I brought my bath salts/oils along. There was also a luxurious floor to ceiling rain shower. The bathroom did lack privacy but this wasn't an issue since I was with my husband. The nightly turndown service that prepped our bed was lovely and it also came with bottles of water and chocolates. I slept so well there and I usually don't feel all that comfortable when I'm not in my own bed. We really didn't do much of anything aside from just relaxing and enjoying the breathtaking views of paradise. Wi-fi is provided throughout the property but we chose to stayed unplugged most of the time. 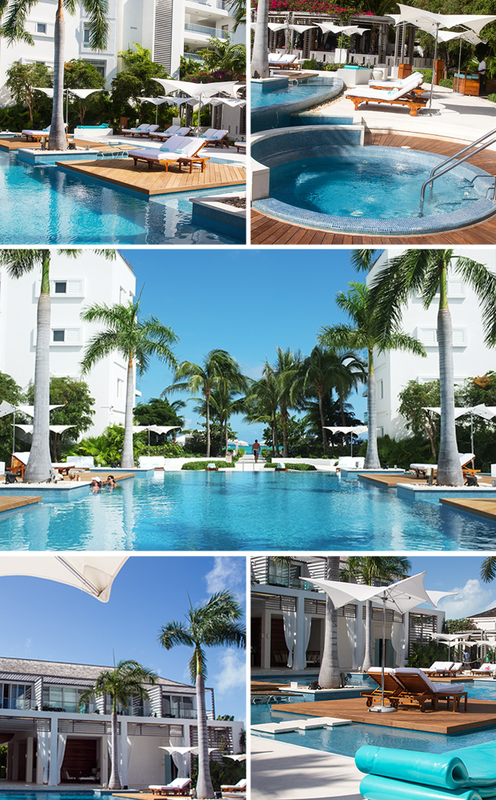 The beach and pool areas of the Gansevoort are very well maintained and the staff was friendly and attentive, making it very easy to get used to having your every need attended to. We chilled out on our lounge chairs under an expansive beach umbrella when we weren't spending time in the water. The sound of the azure ocean was really calming, the water was sparkling and clear and the sand was soft and smooth. 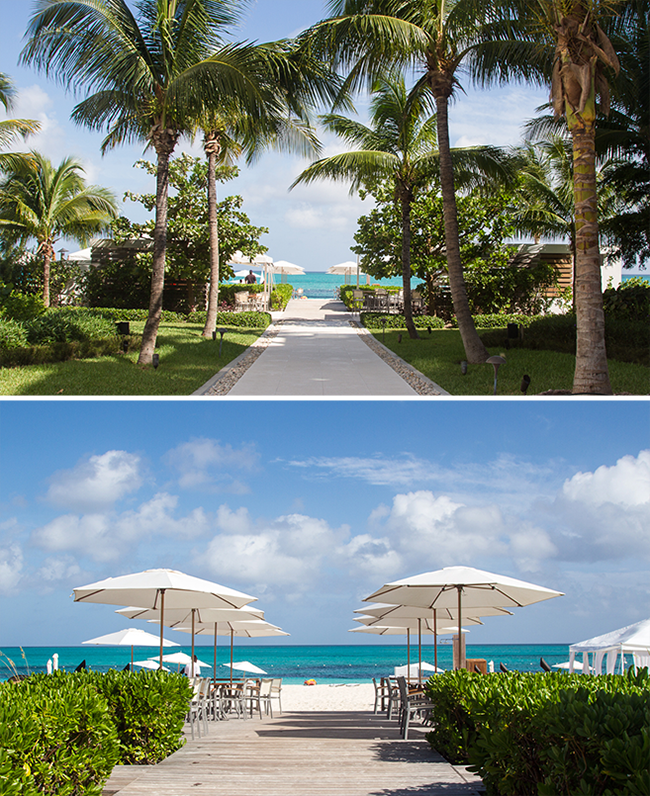 It's not surprising that Grace Bay Beach often tops lists of the best beaches in the world. Sun protection was a priority and we went through two full bottles of sunscreen. I was pretty conscious about re-application and that definitely made me feel better about being sun safe. This was an extremely restful and rejuvenating vacation and we could want for nothing during our time there. We were also fortunate to have marvelous weather with minimal rain. I would definitely return and take an opportunity to explore the island next time. This isn't an inexpensive destination but we were able to save some money by going during the low season and booking a flight/hotel getaway through JetBlue. The only downside was that the food was quite costly within the hotel and it wasn't anything special. There are more dining options but we just didn't feel like traveling to eat outside. The buffet breakfast that was included was great though as it provided many hot/cold options including an egg station where eggs/omelets were freshly cooked to order. 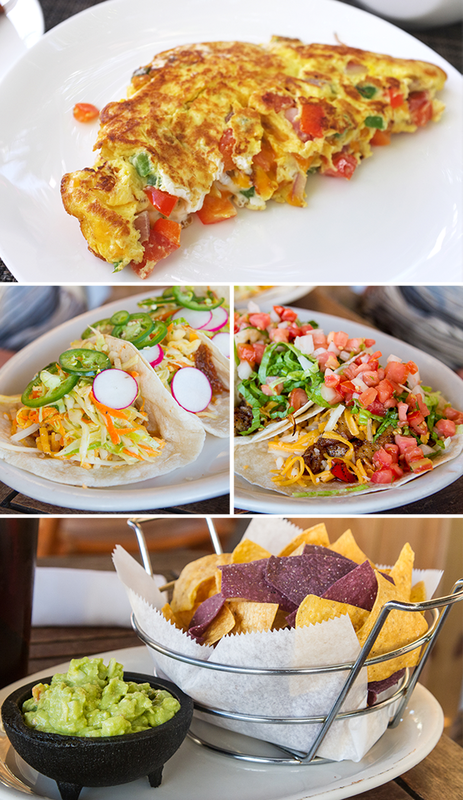 We made our way down the beach one night to a lively beachfront cafe called Somewhere that features tasty Mexican fare and live music. They had the most delicious fish tacos! So I tried to edit my photos down as much as possible but there were still alot so I'll just apologize for the sheer number of pictures in this post as I know it can be tedious to look at too many photos at one time. I can assure you that there are no feet photos. I don't want to look at anyone's bare feet and I have a feeling that I'm not the only one. 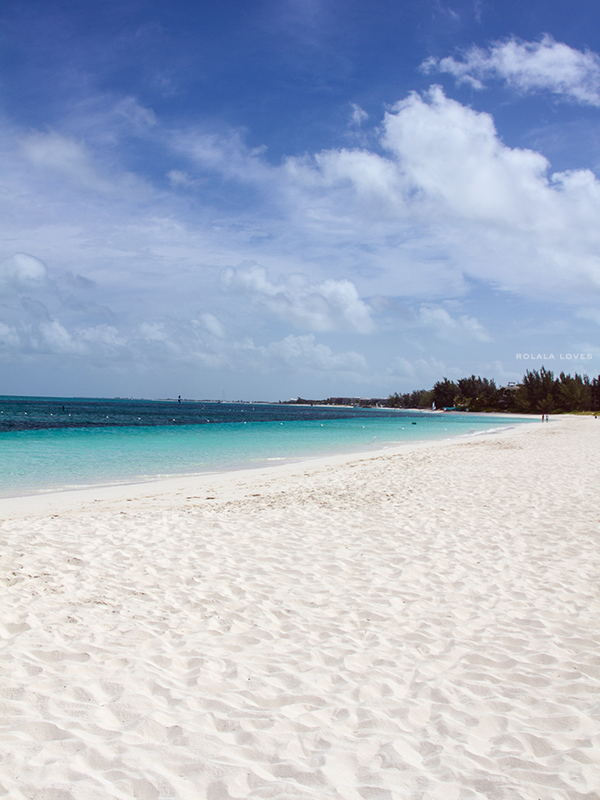 Have you ever been to Turks and Caicos? 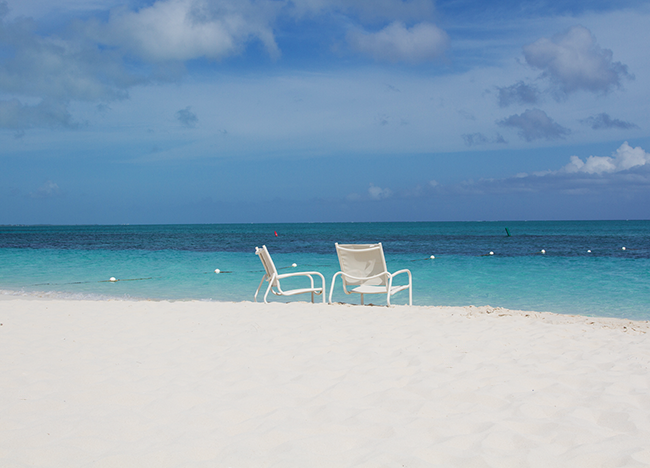 Do you have a favorite beach destination? Oh what a paradise, look at the white sand!!!! Your swimsuit is divine! hey Rowena, it is so inspired to see your enjoyable life sense. Sometimes we do need a great vacation to give us hearts a break. On the another hand, you are so cute in this post. Wish you all the luck!!! Wow is a beautiful place you guys stay I know it must had been very hard to leave great pictures and so detail doll giving us information about the hotel amenities and the cost of food like how they greet you. Great job with this post. Seriously? OMG gorgeous. They almost look like travel photos from some fancy website. I love it. So glad you had fun. breathtaking! i had a friend that used to work there! The photos are fantastic a real dream! Wow.... this is a Paradise!!!!! Wow, so stunning and it sounds like an amazing trip. 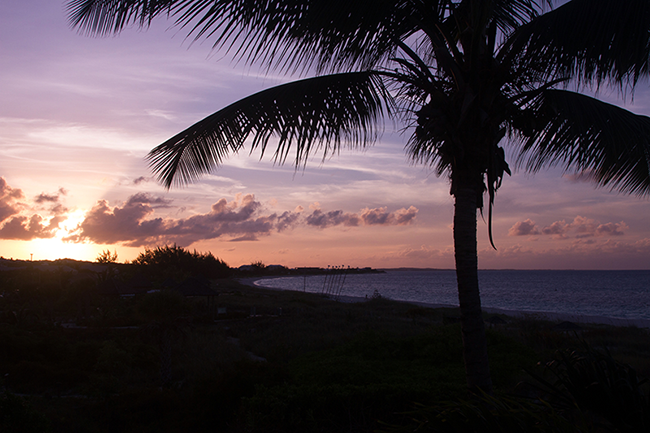 Now you have me really wanting to visit the Turks and Caicos. Well you certainly made it an extra special holiday this year. 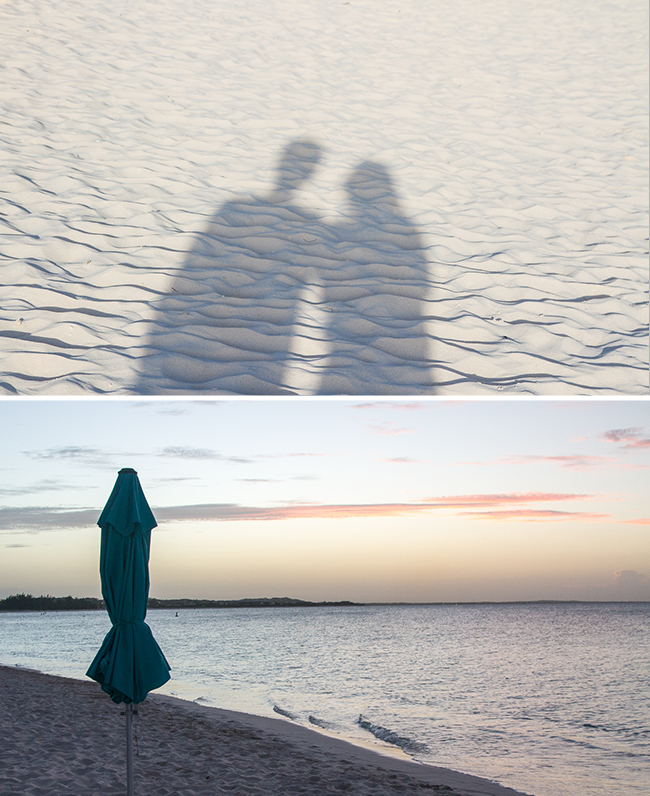 Everything looks perfect particularly the first image with the white sand and the various shades of blue - stunning! 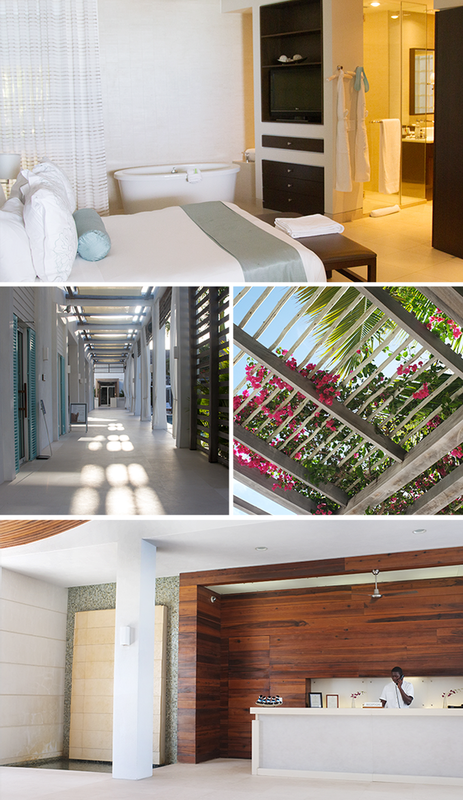 Your resort looks bright and modern with a beautiful pool area. The ideal place to unwind! Marvellous pictures, especially the ones of the pool! It's great to take some vacation...you definitelydeserve it! Oh wow, it looks like the perfect vacations Rowena, so happy for you!! This post was initially brought to my attention through Bloglovin' and.. wow! Utterly fantastic.. heaven is a place on Earth, right?! I'm travelling to Barcelona tomorrow morning and so this post couldn't have come at a more wonderful time for travel inspiration :) The accommodation looks so luxurious, the beaches are beautiful and every photo is of such high quality!! I've been to a bunch of islands in the Caribbean (and I'm from the Caribbean too), but never to T&C. Your photos look spectacular. The food and views are killing me! :) Glad you didn't experience much rain this time of year. Oh my! This looks totally fabulous! I'm so jealous! Hope you have a great time. Oh my goodness! What a beautiful place. I have never seen such white sand before. It looks so dreamy against the blue water. I am glad you were able to get away with your husband. Thanks for sharing all the gorgeous photos! OMG your vacation looked amaze-balls!! LOVE that kitchen would love to have one like that in my future condo. 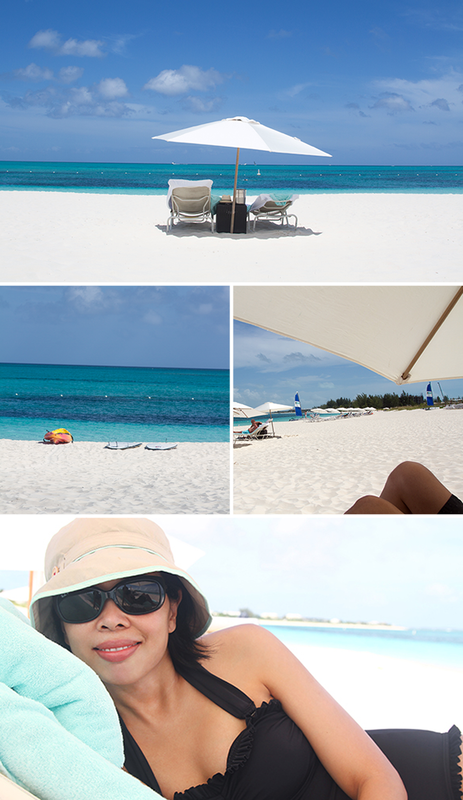 So funny I laid out so many ads featuring Turks and Caicos so cool to see such personal up close pictures. Great photos. Makes me want to go on a vacation, too bad I'm afraid of airplanes. OMG!! This is heaven on earth!!! I would love to have a vacation like this!! WOW beautiful pictures. I quess you had so much fun. What a stunning vacation! Happy Belated Anniversary, Rowena! Bet you had fun; must be soooooo romantic! Oh man, is it summer again already? lol :-) Such gorgeous photos, this place looks like paradise! OMG what a wonderful place!! Looks like you had a fabulous time!! Stunning photos! Ooopsss! Feet picture? I am guilty as charged, for my recent Bali trip *_^ Nice to know that the both of you really enjoyed the trip, best part was that it's so near from where you both are, gosh! Wonderful indeed. Have a wonderful weekend ahead, my friend. I have never been but it sure looks like a lovely vacation spot. 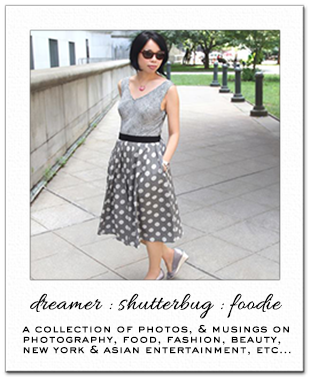 Hi Rowena, these photos are gorgeous. 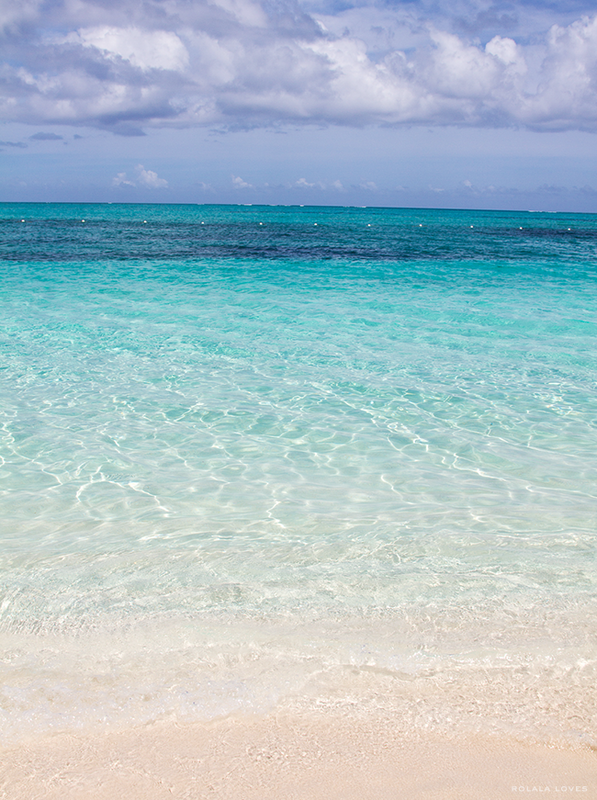 I've never been to Turks and Caicos, but really want to go now! I wasn't aware of your health issues, but am so happy you are better and had a great trip. p.s. love your bathing suit! Oh my God, you are a lucky girl! If you take me there I'd stay forever! Your photos are so beautiful, look at the water, the sand! I'd go crazy! This is the perfect place for a rest and anniversary celebration! What else to do except enjoying this paradise at the beach the whole day? As you probably have already noticed, I have never been to such an amazing place! My cousin went there for his honeymoon! Every picture you take seems like it's straight out of an ad. Did you ever find it to be too quiet? It looks like paradise! I love beach vacations. I've never been to Turks and Caicos but I've been to Maui and it was amazing there. Something about the sea air and the sound of the water is so relaxing. I sleep so much better at the beach. Turks and Caicos would be a much easier trip from the east coast!! Your pictures are so beautiful...makes me wish I was at the beach right now! So glad you had a great trip! Wow!! Divine!! =D It looks like you've had a blast and totally rejuvenated! Beautiful place and yea, I don't see a reason why anyone wouldn't love this place. Love the white sandy beach and turquoise blue water. so picturesque! i just want to dive into that crystal clear water!!! Rowena, this was so spectacular! It's so perfect, it looks like a dream. Now that is a vacation. You look so cute and i love your bathing suit. 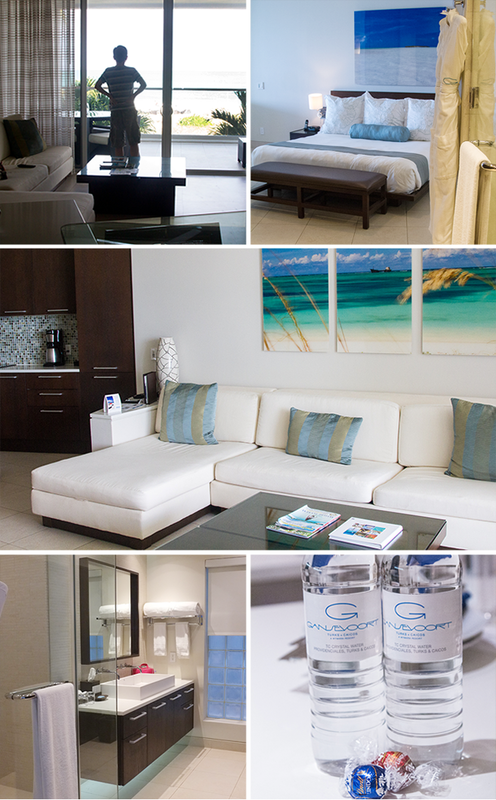 I love the modern rooms and amenities. Thank you so much for sharing. Beautiful! Wow, I loved all your pictures! It looks like an amazing trip. Thanks for sharing at the SITSGirls sharefest! 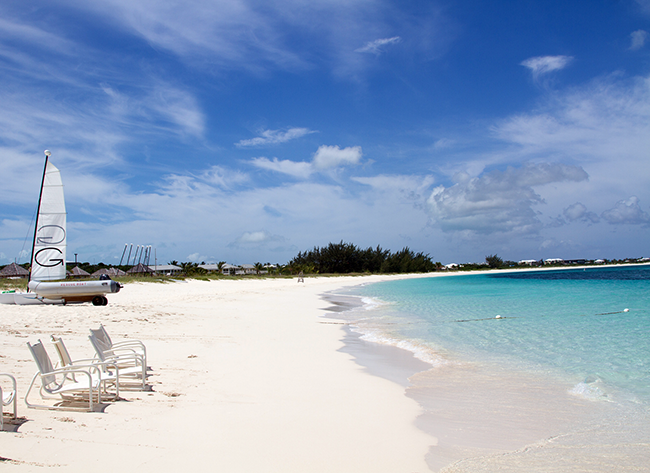 Turks and Caicos is on my bucket list. Thanks for sharing the beautiful pictures. Oooh, These photos are so beautiful, Rowena. Well, intially I didn't click on read more and was wondering how your vacation post didn't have any photos at all. I'm glad to hear about the stellar service provided and how you and your hub enjoyed yourselves by the pool and unplugged yourselves from the world. The bathtub is so surprising to be away from the rest of the bathroom. I love the white sandy beaches and the clear blue waters. It's great that you got a good price for these all while taking the well-deserved break you needed. I'm way too pale to truly enjoy any sun/beach vacations, but all your photos are beautiful and I hope to visit one day. I definitely don't think there are too many pictures. :) One question though, is the bathroom not separated from the bedroom? I didn't know too much about Turks and Caicos prior to reading about this post, but I'm seriously considering it for a future trip due to accessibility (anywhere with USD = familiar territory). Oh boy what a beautiful trip!!! DID I see this? OMG!!! Now I'm starving! Very pretty suit! !